"Today we celebrate our Independence Day!" Other Stars: Robert Loggia, Viveca Fox, Mary McDonell, Judd Hirsch, Harvey Fierstein, Randy Quaid, Harry Connick Jr.
MPAA Rating: PG-13 for sci-fi destruction and violence. On the one hand reminiscent of the glory days of Sci-Fi invasion flicks of the 1940's and 1950's, ID4 unfortunately turns away toward more of the trademark Dean Devlin / Roland Emmerich Hollywood extravaganza with the usual overplay and HUGE special effects, yet still rallying around the human element—something noticeably absent when they lost their heads in their next movie, the gargantuan flop, Godzilla. On the surface I despise ID4 for all its flashy mass appeal, its over-dependence on effects and pretty boy heroism. Still, I can't stop watching this film every freaking time it comes on T.V. or on video (gasp! My stepdaughter made me do it!!) And now I finally realize why. After starting off as a film student at Columbia College in Chicago, I later became an English major at Loyola University. There I became enamored with the story of a young prince who was thought a fool-hearty rogue, but would later become a great and beloved king, leading his men into battle with a rousing speech bestowing the world forever upon the"few, We happy few, My merry band of brothers." So invigorated by this speech of immortality, this small, out-numbered, haggard army overcame the superior numbers and weapons of the French, saving the day for England. The story, of course, is Henry V, and the author William "The Bard" Shakespeare. So it is my weakness for both the underdog, as represented by the human race playing David to the invading Alien's Goliath, and for any allusion, no matter how improbable, that pays homage to the bard's best play that brings me to watch and rewatch ID4 again and again. Like smoking, some habits are hard to break. In case you've been hibernating in a log on some remote island in the South Pacific, Independence Day tells the story of the invasion of Earth by Alien's intent on usurping ownership in order to inhabit the planet with their own species. To live without nuisance, they must evict the current tenants—the human race. The young, inexperienced and besieged President Whitmore, played quite well by Bill Pullman, must try to keep the citizenry from panicking and does so by staying put in the White House, despite the hovering craft directly above. "Today, the answer to the question 'Are we alone in the universe?' has been answered," he says in a news conference. It is then left up to the heroics of David Levinson (Jeff Goldblum) and Captain Stephen Hiller (Will Smith) and the most unlikely of heroes, the drunken biplane pilot Russel Casse (Randy Quaid), to together save the day for Mother Earth's bipedal dwellers. It is then, at the infamous Area 51 (for the use of which the Air Force would not participate in the film), that the President (and former fighter pilot) leads his ragged troops into battle with the Goliath Alien forces as did Prince Hal, with an inspiring speech about saving humanity, and bringing the people of the Earth together to fight for a holiday that would be no longer only for Americans, but celebrated the world round as the Earth's Independence Day. Image Transfer Review: There is very little to say here, this is a stunning, crisp, near perfect transfer, obviously given tender loving care by the folks at the Digital Video Compression Center. The colors are tight, well rendered without bleeding or pluming, and do not give away often the quality of the models or CGI. The source is very clean, and the only real issue I have with it deals with Toshiba's horrible downconversion algorhythm, which causes occasional aliasing distortion. The only thing holding this back from the coveted A+ marking is the lack of near 3-D appearance projected by the best of transfers, but this is a top notch transfer nonetheless. Audio Transfer Review: The THX sequence grabs you and the movie doesn't let you go. Right from the opening credits the sound is powerful, loud and immersive, and watch out if you don't duck you get hit in the back of the head as the first alien ship passes across the soundstage back to front! The LFE channel is throwing a blow-out bash, and it's invited all of its treble friends over just to blow smoke in their face. The bass pumps below the surface of the soundtrack like an alien heartbeat, throbbing with anxious anticipation. The discrete channeling has been used brilliantly throughout; it does not seem the missed any of the hundreds of opportunities for panning with all of the flybys, dogfights, explosions and flying cars. Wonderfully accurate and powerful. Unfortunately the dialogue-only scenes are too quiet, so that when the incidental music or sound transitions come they near blow the subwoofer in my head! This is the only flaw I could find, albeit a rather annoying one. The menu system is not dissimilar to those for the Abyss, but better. Let's get started! I won't go into it but it isn't staggering, but still interesting. It comes with director's commentary. The Trailers range from "oh, ain't this frightening" to the humorous "Duh!" Contains conceptual artwork for alien beings, sets and props and alien ships. production photographs (300+): includes much of the downed helicopter shooting, Will smith pumping up, sweeping (smoothing) the Salt Flats desert, aliens, Area 51, etc. I think there were 308, but I might have lost count. Very cool. Storyboard sequences of the "welcome wagon," "destruction" sequences and original biplane ending. 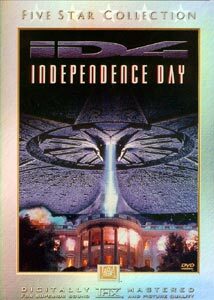 Begins in a similar manner as The ID4 Invasion—as a mockumentary—until the titles come, after which are informative interviews with the effects crew about the creation of the CGI effects, alien crafts and creature models, crosscut with scenes from the film showing the results of their efforts. This piece comes with chapter stops included, and a menu you will NOT soon forget! A mockumentary ala the Sci-Fi Channel's Blair Witch Project and borrowing from Orson Welle's War of the Worlds. At first I wondered "why?" But pondering on it after watching the film, I realized that this is the movie inside the movie. Here is the "news coverage" footage stand-alone, enabling us to concentrate on this second-team effort without the clutter of, well, the movie! The piece then switches modes into a behind-the-scenes type featurette with cast and crew interviews. Originally aired on HBO's First Look, this behind-the-scenes documentary is hosted by one of my favorites, Jeff Goldblum, who scored big with this movie and the Jurassic Park series as well. Unfortunately, information here is recycled from or to the other documentaries. It's probably better not to watch all three at one sitting. Dean Devlin and Roland Emmerich discuss all aspects of making ID4. Did you know that the first cut footage was excised because of a male-male kiss (peck) between Goldblum and Fierstein ? Did you know that Matthew Perry was originally to play the Harry Connick Jr. character? Did you know that the quote above was not originally part of the President's borrowed St. Crispian Day's speech, but was added at the last minute because they were being pressured to change the name of the film? There are more interesting facts and trivia to learn from this track you'll have to glean yourselves. Oscar®-winner Volker Engel and Doug Smith discuss the detailed aspect of EVERY effect in the film. Not the most exciting track, but very interesting, especially for budding filmmakers. Did you know they shot at the hangar used to house Howard Hughe's Spruce Goose? OR that they had 325 people on the payroll? While only the Making Reality documentary presents us with interesting material (and is less marketing oriented), the three pieces are a nice addition but not earthmoving extras in themselves. Although not as extensive in terms of numbers of supplements, what I do appreciate nonetheless is the superior yet simple and still interesting menu system and organization of these extras on the disc. It was literally exhausting going through the Fight Club extras, as well as the overbearing menu system on The Abyss, which I found aggravating. The only thing I didn't like is the timer involved with the language and main menu, where if you don't choose on the former it moved to the latter, and if you didn't choose a movie version on the latter it plays the movie. The saving grace are the commentaries, and even these at times are slow or uninteresting. If there are any hidden features, they are still hidden from me. Lest I forget, Fox, in its new found wisdom, has included both the original theatrical and extended (by some 8 minutes) cuts on the same disc. Very nice.